WARNING: this page contains procedures that render warranty void! 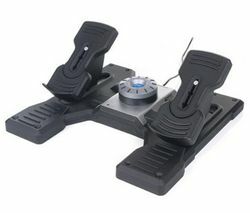 When I looked for a rudder pedal and read reviews about, somehow nobody seemed to notice how much force theese pedals need to move from the centerpoint, which means you cannot make precise movements. This could be considered as a good thing, while I think its real bad, especially when flying a helo, where precision is everything. Besides, the USB cable is quite short, you might need an extension cable if the computer is more than 1 meter (about 3 feet) away from the pedals (yet another thing the reviews forgot to mention). The manual says, you can adjust the tension of the pedal. The truth is, you cannot adjust the preload of the spring that returns the pedals to center position, but/only the dampening. Which is OK with me as the tension is just right, I just wanted to make this clear. I use it with XP, and I did not need to install any software/driver, just plugged in, and I could use it right away in FS. If you are here, this probably means you also dislike this 'click-in-center' 'feature'. Good knews, it can be fixed without endangering any species, and changes are reversible (just keep the removed parts in a safe place). 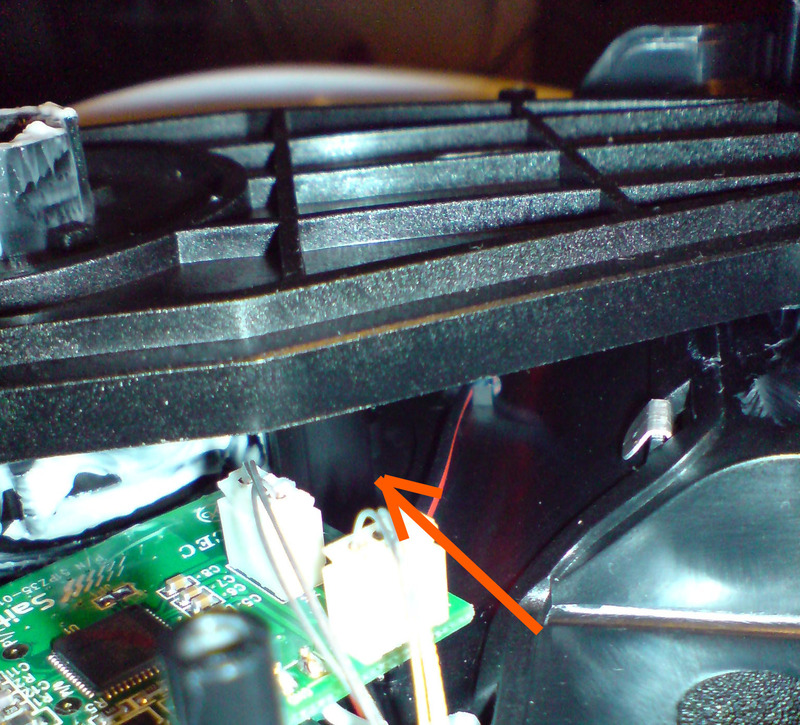 Its pretty easy to disassemble the controller, however, there are some sensitive wiring inside, so you should always practice caution. Look for some sort of console so you can work on it upside down while the pedals are not pressed at all. I used a medium size wastebin. Ok, here we go. Please note that its very messy inside the chassis: grease everywhere, gooey sticky substance in the damper, so have some tissues ready, and some non-solvent cleaning fluid to clean the outside afterwards. 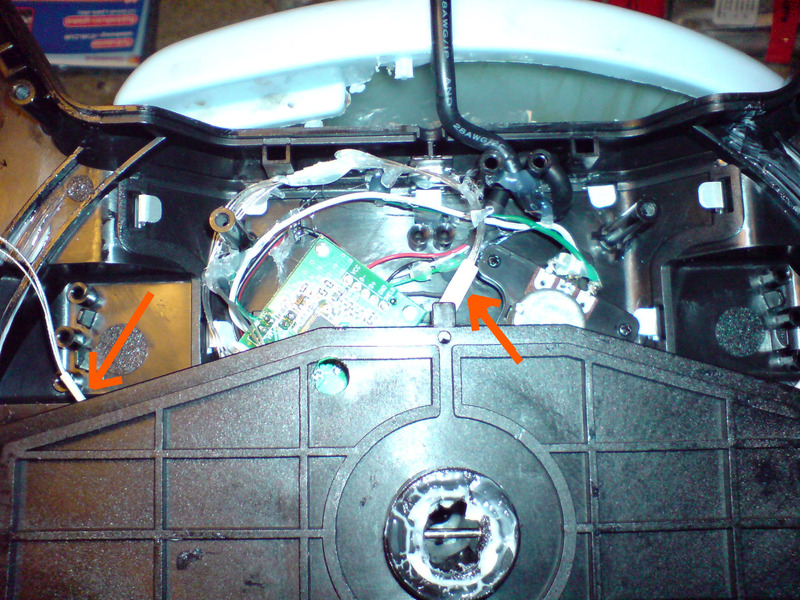 the pads are removed, exposing the hidden screws. Now the backplate is removed. 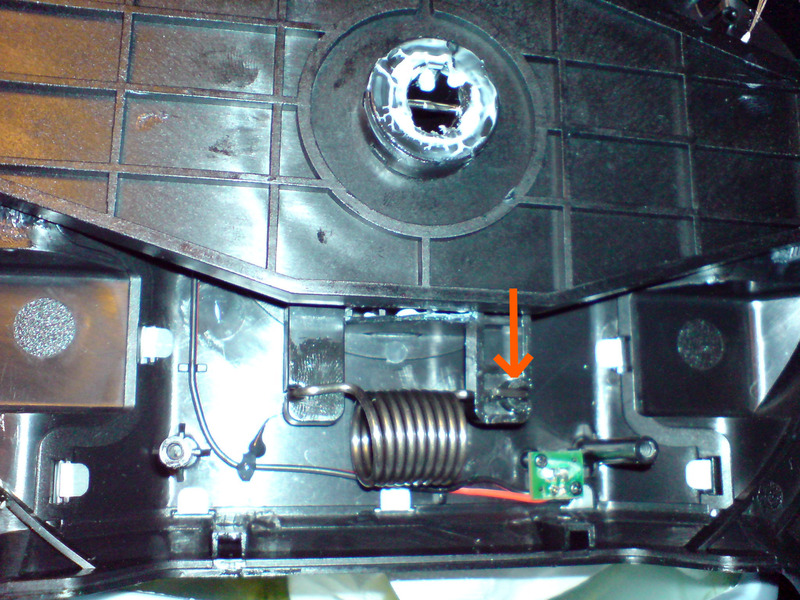 As you can see, the pedals and the internal assembly are supported by the backplate, that is why it is useful not to stress them while it is removed. Pay attention to the wiring: it goes from the USB controller, routed through the rotor and to the pedals. 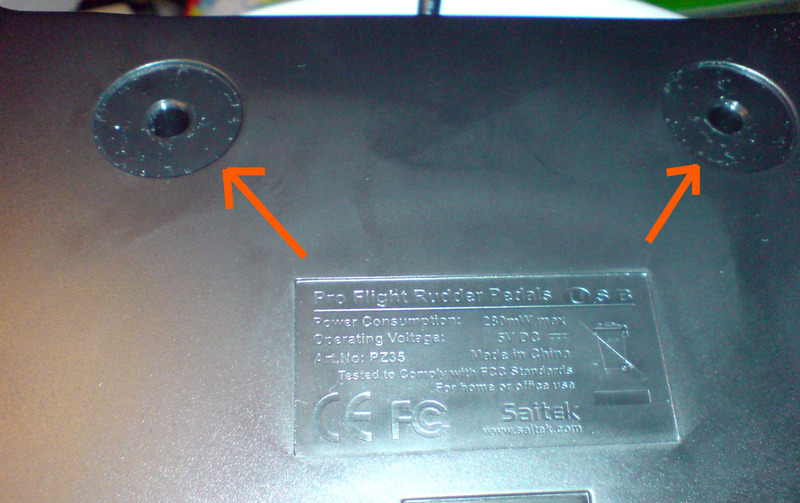 We do not want parts flying through the air, so carefully remove the spring before moving on. remove the marked side with a pair of pliers. Now remove the damper (the big adjustable knob that says tension adjustment). I used a small screwdriver from my swiss army knife. notice the small hole up left, through this you can remove small parts later. once the rod out of the way, remove the ring, and simply push the damper out. Once the damper removed, the the rotor becomes loose. You can cautiously work your way underneath. 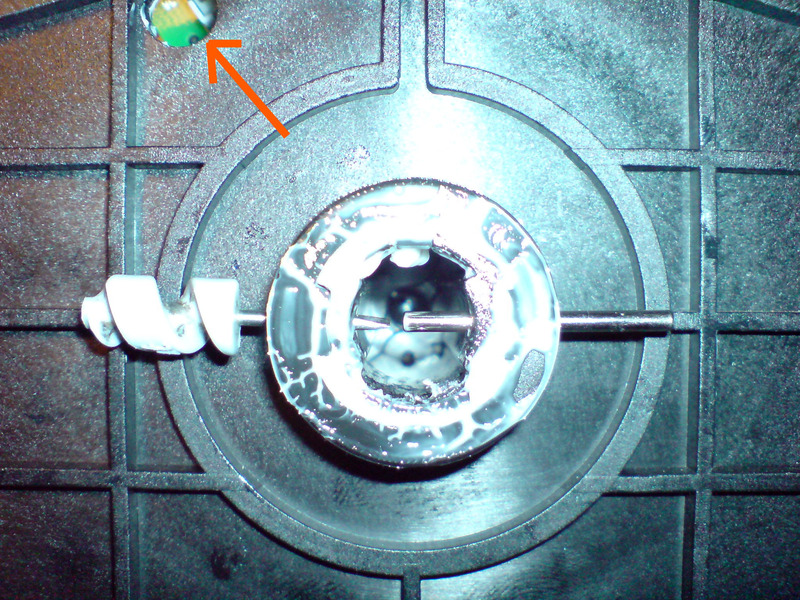 You will find a small cylinder with a spring loaded, round-head rod. Position the hole shown in the previous picture above the rod. Be careful with the wiring! Use nippers to help the rod and spring out. Assembly is pretty straight-forward, you just need some patience to get that damper back in place. You might want to wash your hands at this point. You will notice that the rudder still has a decent center-feel, without the annoying resistance to move. Smooth, precise - perfect!